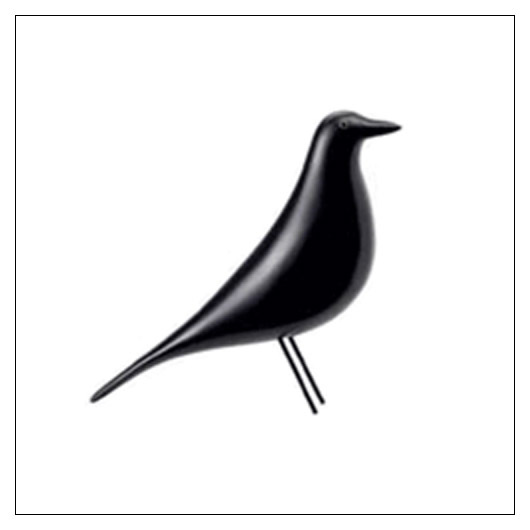 Vitra Eames House Bird (msdsovhsbd) at Pure Design / Accessories / Decorations ::: Furniture for the Home, Office, Home Office, and More at Pure Design Online! Charles and Ray Eames enhanced the collage in Eames House to include countless objects they brought back with them from their travels. For over 50 years, at the heart of their living room a black wooden bird figure stood on the floor, evidently a piece of American folk art they especially appreciated and which they frequently used as an accessory in their photos. Materials: Black lacquered solid alder, steel wire. Sorry, this product is not available until April. Please call 800-483-5643 if you would like to pre-order this item.